Omron is world famous for it’s health equipment. 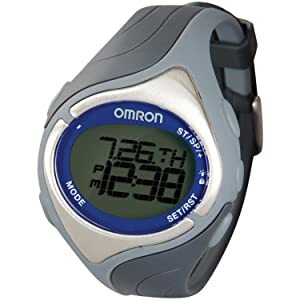 Their Blood pressure monitors mainly Omron BP786 are unparalleled. However, they have only three models in Heart rate monitors. Omron HR-100CN, Omron HR-210 and Omron HR-310. Omron -100CN and Omron -310 are chest-strap monitors whereas Omron HR-210 is a strapless monitor. They are having limited training features. There are in competition with Polar FT1 and Polar FT4 models. The price is reasonable for all the three models from Omron. Good: Very simple, Easy to use design. User replaceable batteries. Bad: The Heart rate monitor does not have coded transmission, there could be interference from the nearby devices. If you want to avoid interference from other devices then opt for Polar FT7 Heart Rate Monitor. Bottomline: Overall, an average heart rate monitor, with reasonable price. There are number of models are available in market with more features and more or less same price. Good: It is strapless, so no discomfort of the strap around the chest. Bad: It does not display heart reading continuously. You need to press the keys for 6-10 seconds to get the heart readings. BottomLine: The price is very reasonable. It have important features that you care during workout. Only issue is, it does not display the heart rate readings continuously. If that does not bother much then, it is good for beginners. 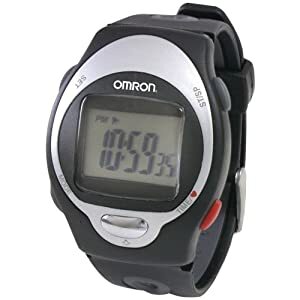 Omron HR-310 is a chest-strap heart rate monitor. It display the calorie count and the fat burnt. Good: It has more features compared to Omron-100CN and Omron HR-210. The tap-on-lens feature, helps to navigate from one application to another. Bad: Likewise Omron-100 CN, this too don’t have coded transmission. In gym, better to wear the receiver and not rely on the gym equipment for the readings. In addition, some user experienced delayed readings. BottomLine: This is the upgraded model of Omron-100 CN. Good features. Though the chest strap is not as comfortable as competitors like Polar. But, cheaper than the other competitive models. First time buyers, not sure what to expect and want to spend reasonably then you can opt for Omron HR-310. If you want Strapless then go for Omron HR-210. 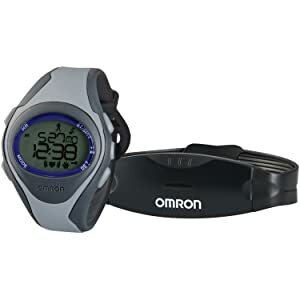 I will not recommend Omron HR-100 CN, when compared to other two models, the value addition by this model is negligible. This series is good for its cost. However, if you are willing to spend a little more then you can opt for Polar FT7, FT4 and FT1 series or Polar FT80, FT60 and FT40. These two series from Polar are very good choice for heart rate monitors.